← Does dry skin cause wrinkles? 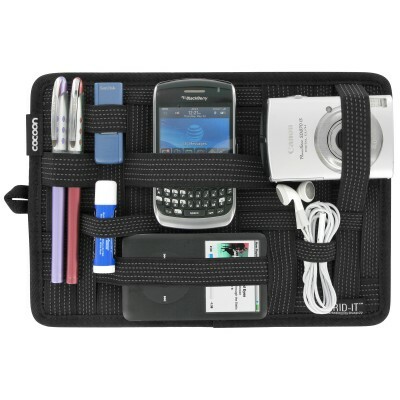 Tired of that tangle of cables and wires at the bottom of your bag? Need a place to store your iPod, Blackberry, digital camera, flash drive, laptop cables and other little devices – all in one place? This clever little Grid-It! organizer, weighing in at under .5 lbs. and sized at 7.5″ by 10.5″, is here to help. The rubberized woven elastic bands allow for all sorts of creative configurations so you can make it work to fit your personal needs. Find it at cocooninnovations.com for $18. This entry was posted in On Our Radar and tagged Cocoon Innovations, Grid-It! Organizer. Bookmark the permalink. What a wonderful and innovative gift. Ideal for the person who one has a hard time finding a gift for! Did you buy one? Do you like it? Please let us know…..